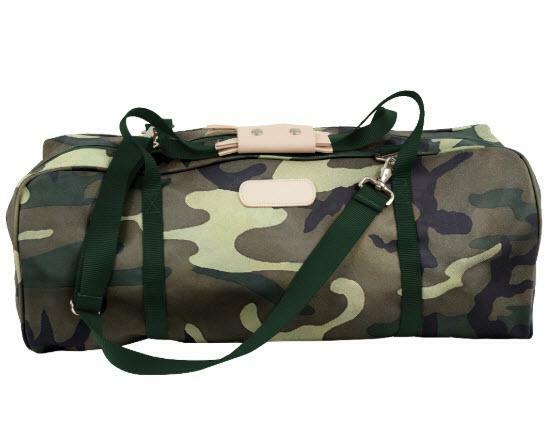 Our largest duffel, now with detachable nylon shoulder strap. Designed for easy access. Joe Duffel is roomy at a Size of 13h x 26w x 13d inches. Have 15 canvas colors to choose from and leather zippered pulls and monogram goes on the leather tab on the front of the duffel. Monogram is all caps (HNJ) or choose text up to 16 characters (Smith). Personalization is on the leather tab is your choice of ink foiling or heat stamp. John Hart makes quality canvas and leather luggage that combined with this Joe Duffel would make an excellent gift for graduates or newlyweds for life time of travel needs. Choose canvas color, monogram (HFJ), traditional last name larger monogram or text 16 characters ( Smith) and personalize in either ink foiling in silver or gold or a heat stamp. Price: $162.00 In stock! - Browse this brand: Jon Hart DesignOur products are custom made to your specifications. This product ships up to 4 weeks after your order is placed.